The ReSMiQ management team is preparing the 2018 Annual Report, the annual symposium, the annual general assembly of the members and the annual meeting of the Board of Directors. These activities will allow us to take stock of the past year and focus on future directions. The program for this edition will be posted online in the coming weeks. It will be held on May 9 at Concordia. We can already announce the presence of the invited lecturers including Gabriela Nicolescu from Polytechnique Montreal, Hassan Rivaz from Concordia University, both members of ReSMiQ, as well as Keith Bowman from Qualcomm Technologies (USA), DL of IEEE SSCS, and Sorin Cotofana from Delft University of Technology (Netherlands), DL of IEEE CASS. See you there in large numbers. As part of the poster competition, which will be presented during a special session, graduate students affiliated with ReSMiQ have until April 9 to send us their proposals for papers. Best presentation prizes will be awarded to the top three submissions selected by a special jury (more details). We are also pleased to announce that ReSMiQ has a new member, professor Pascal Giard from the electrical engineering department of the École de technologie supérieure. Its research interests are anchored mainly in 3 of the ReSMiQ themes, which are “Microsystems modeling, simulation and design methodologies”, “Microsystems implementation and validation”, and “Microsystems for information technology and telecommunications”. He applies his IT knowledge to these areas to quickly validate or verify ideas, develop simulators, generalize and automate design, or develop prototypes. He designed and optimized numerous algorithms, designed hardware architectures, and implemented hardware and software on several types of platforms including embedded systems. He has produced many demos, including software radios based on GNU Radio and USRPs. In addition, a real-time communication demonstration using one of the prototypes he developed which won the Best Technical Demonstration Award at the 2015 ReSMiQ Innovation Day. As the founding organization of NEWCAS, ReSMiQ is proud to support the organization of editions outside the province of Québec. After Strasbourg (2017), Vancouver (2016), Grenoble (2015), Paris (2013), Bordeaux (2011) and Toulouse (2009), it is up to the city of Munich to host this world-class conference thanks to the involvement of Professor Erkan Isa of the Fraunhofer Research Institute and his team. As with previous editions, ReSMiQ will provide financial support to all members and students attending the conference. More details will be communicated shortly. In 2020 the conference will be back in Montreal under the chairmanship of Professor Yvon Savaria of Polytechnique Montréal. A call for papers will be distributed during NEWCAS2019. 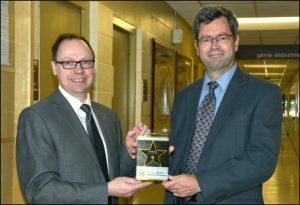 – Dr. Martel from Polytechnique Montréal received the Pythagore Award from UQTR which celebrates the excellence of the graduates of the Trois-Rivières university. 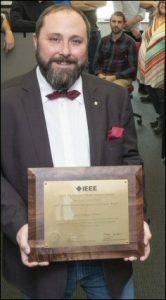 – Dr. Pratte from the Université de Sherbrooke received the 2018 Radiation Instrumentatn Early Career Award at the IEEE Nuclear Science Symposium and Medical Imaging Conference. 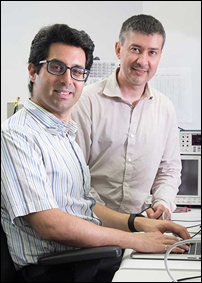 – Dr. Nabki and Dr. Deslandes from École de technologie supérieure who founded SPARK Microsystems, a Montreal-based company, were selected to win the 6th Nokia Open Innovation Challenge (NOIC) ahead of more than 300 companies from around the globe. – Dr. Langlois from Polytechnique Montréal is co-chair of the DASIP conference to be held in Montreal from October 16 to 18, 2019. ReSMiQ is a group of researchers in an interuniversity research center that can count on the support of the Fonds de recherche du Québec – Nature et technologies (FRQNT) and nine (9) Quebec universities involved in microsystems research whose mandate is to serve its members and to foster conditions for graduate student researchers to go to the end of their abilities to innovate. C. Therrien; W. Lemaire; P. Lecoq; R. Fontaine; J.-F. Pratte, ”Energy discrimination for positron emission tomography using the time information of the first detected photons”, Journal of Instrumentation, vol 13, (1), p01012, 2018. Nolet, Frédéric and Dubois, Frédérik and Roy, Nicolas and Parent, Samuel and Lemaire, William and Massie-Godon, Alexandre and Charlebois, Serge A and Fontaine, Réjean and Pratte, J.-F.. "Digital SiPM channel integrated in CMOS 65 nm with 17.5 ps FWHM single photon timing resolution", Nuclear Instruments and Methods in Physics Research Section A: Accelerators, Spectrometers, Detectors and Associated Equipment, Vol 912, 2018. Roy, Nicolas; Nolet, Frederic; Dubois, Frederik; Mercier, Marc-Olivier; Fontaine, Rejean; Pratte, Jean-Francois, "Low Power and Small Area, 6.9 ps RMS Time-to-Digital Converter for 3-D Digital SiPM", IEEE Transactions on Radiation and Plasma Medical Sciences, vol. 1, (6), pp. 486-494, 2017. Bouchard, Jonathan; Samson, Arnaud; Lemaire, William; Paulin, Caroline; Pratte, Jean-Francois; Berube-Lauziere, Yves; Fontaine, Rejean, "A Low-Cost Time-Correlated Single Photon Counting System for Multiview Time-Domain Diffuse Optical Tomography," IEEE Transactions on Instrumentation and Measurement, vol. 66, (10), pp. 2505-2515, 2017. Tetrault, MA; Therrien, AC; Lemaire, W; Fontaine, R; Pratte, Jean-Francois, "TDC Array Tradeoffs in Current and Upcoming Digital SiPM Detectors for Time-of-Flight PET," IEEE Transactions on Nuclear Science, 64, (3), pp. 925-932, 2017. Convert, L; Lebel, R; Gascon, S; Fontaine, R; Pratte, Jean-Francois; Charette, P; Aimez, V; Lecomte, R, "Real-Time Microfluidic Blood-Counting System for PET and SPECT Preclinical Pharmacokinetic Studies," Journal of Nuclear Medicine, 57, (9), pp. 1460-1466, 2016. Nolet, F; Rheaume, VP; Parent, S; Charlebois, SA; Fontaine, R; Pratte, Jean-Francois, "A 2D Proof of Principle Towards a 3D Digital SiPM in HV CMOS With Low Output Capacitance," IEEE Transactions on Nuclear Science, 63, (4), pp. 2293-2299, 2016. Tetrault, MA; Therrien, AC; Lamy, ED; Boisvert, A; Fontaine, R; Pratte, Jean-Francois, "Dark Count Impact for First Photon Discriminators for SPAD Digital Arrays in PET," Ieee Transactions on Nuclear Science, 62, (3), pp. 719-726, 2015. Therrien, AC; Berube, BL; Charlebois, SA; Lecomte, R; Fontaine, R; Pratte, Jean-Francois, "Modeling of Single Photon Avalanche Diode Array Detectors for PET Applications," Ieee Transactions on Nuclear Science, 61, (1), pp. 14-22, 2014. Time-of-flight measurements are becoming essential to the advancement of several fields, such as preclinical positron emission tomography and high energy physics. Recent developments in single photon avalanche diode (SPAD)-based detectors have spawned a great interest in digital silicon photomultipliers (dSiPMs). To overcome the tradeoff between the photosensitive area and the processing capabilities in current 2-D dSiPM, we propose a novel 3-D digital SiPM, where the SPAD, designed for maximal photosensitive area, will be stacked in 3-D over the electronic circuits, designed in a CMOS node technology (Fig.1). All readout circuits will be implemented directly under the SPAD real estate, including quenching circuit, time-to-digital converter (TDC) and digital readout electronics. This paper focusses on the TDC element of this system, designed in TSMC CMOS 65 nm (Fig. 2). This ring oscillator-based Vernier TDC requires only 25 × 50 μm 2 and 160 μW, and achieves 6.9 ps rms timing accuracy (Table I). Fig. 1. 3-D architecture of a 50 × 50 μm2 single pixel. Fig. 2. 25 × 50 μm2 ring oscillator-based Vernier TDC built in TSMC CMOS 65 nm technology. Eq. 1. Figure of merit proposed in the paper. The variable is the total jitter of the TDC. TABLE I TDC Performance and Comparison, including the FOM proposed above.